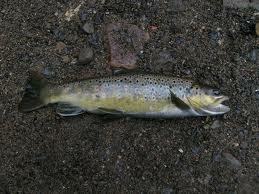 The Ararat River has become a major trout fishing destination. After the completion of the Ararat River Restoration project a few years ago, the streambanks were easier for fishermen to access, the river by being more narrow and having huge bolders and deeper holes became better capable of supporting fish habitats. This area is now classified as a delayed-harvest stream as rainbow, brook and brown trout are stocked throughout the cooler months by the N.C. Wildlife Resoures Commission. Delayed harvest means during the months of October through the first week in June, fishing by means of catch and release, using single hook artifical lures, is allowed. This kind of fishing stresses the angling experience rather than taking home the catch. 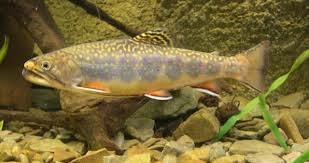 The fish can be caught but they must be released back into the water. 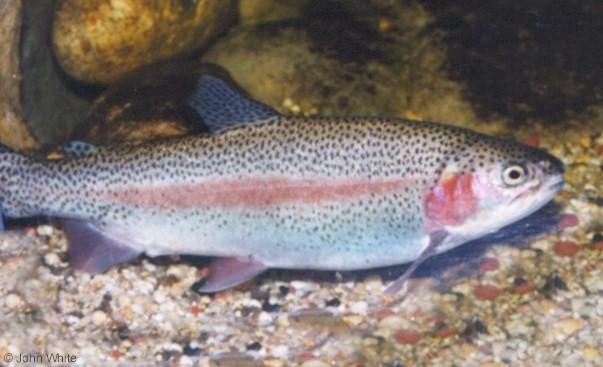 Trout can only tolerate streams where the temperature does not go above 70 degrees so from June through the end of September, when the water is warmer, anglers can use artificial or natural bait plus any type of hook to catch and take home up to seven trout a day, however they must have a fishing license. 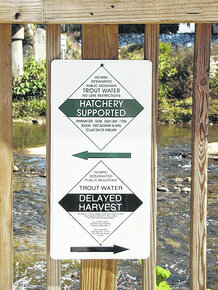 This delayed harvest system will provide a high level of trout for an extended period of time. This cache was placed on the Ararat River Greenway by the Mount Airy Museum of Regional History as part of a grant funded by Kids in Parks – Blue Ridge Parkway Foundation, Blue Cross Blue Shield North Carolina Foundation and the North Carolina Humanities Council, to encourage physical activity and exploration of the history of our community.